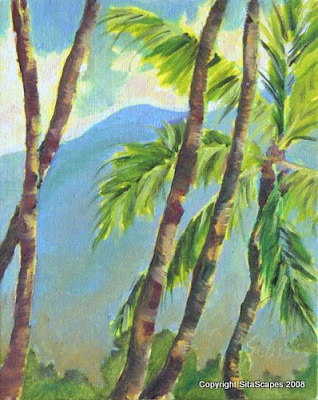 Artists Comments: The light dancing against the trunks of a grove of palm trees caught my attention. Then, I could see the faint outline of Hualalai Mountain in the background. I attempted to paint a small piece of the scene instead of trying to fit the whole environment on a piece of canvas. I enjoyed the simplicity of painting a limited number of objects although when there is less to look at, there is more pressure to make the few objects memorable.